I’ll admit it; many of the spaces featured here each week are not quite (ok, not at all) immediately attainable for the normal folks like myself. But…that’s where the daydream aspect comes into play. However, it’s fun to feature more true to life spaces when I come across them. This week’s space is just that. Attainable, asthetic, fun, colorful, unique, creative, bold, and bright. I threw all of those words at it because it is a great example of how a love of books can visually transform a room and provide deep character. This is definitely a book lover’s room. Let the daydreams commence. I like the step ladder! 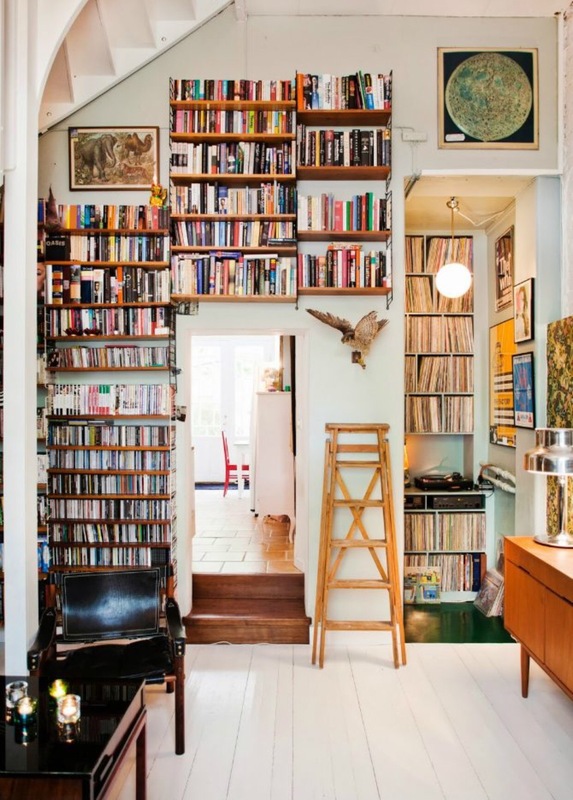 That bad boy is definitely needed…the owners have books all the way up to the rafters! It’s a fun little room. It looks lived in…its warm. Thanks for checking out the post! I’ve always fancied some sort of platform over stairs to utilise all that going to waste shelf space! I agree…it’s functional, and looks great too! I’d probably do without the bird as well…there are plenty of living ones outside to look at! This home definitely doesn’t lack for comfort…there’s tons of music in different formats, and you’re right, an awesome kitchen to whip up some good stuff to enjoy while hanging out in this fun space. Storytime Saturday, featuring an excerpt from an as yet untitled piece.